Why will investors coming out of the BRIC countries always have an advantage in emerging markets? They expect the unexpected. This column is going to be a bit esoteric and discuss quantum mechanics and math puzzles as they relate to investment. These are not topics that people think about every day, let alone understand, but the abstruse has just invaded our daily lives in the form of an extremely unlikely event: the earthquake and tsunami in Japan. 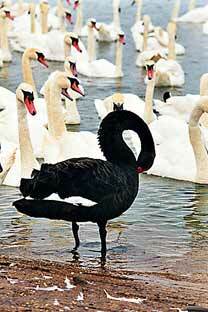 The events constitute a "black swan" event, or something that has an extremely small chance of happening. These events are so unlikely that people – including governments and investment bankers - spend very little time thinking about or planning for them. The authorities in Japan, of course, had plans drawn up to deal with the consequences of a major earthquake, but they didn't go as far as thinking about what to do if the back-up diesel generators to run the cooling systems at the Fukushima nuclear plant got washed away, the batteries failed, and all six reactors went into meltdown at the same time. The authorities considered it so unlikely that all these black swans would line up like ducks at a carnival shooting range at the same time that not much thought was spent on such a scenario. It’s an understandable mistake. Our lives are made up of a succession of ordinary days that form the bulk of our experience. We get used to regular patterns and use them to predict what will happen next. Summers are hot and the bus to work comes at 8:17. Indeed, term "black swan" comes from the danger of assuming everything stays the same. The swan was used in a famous example of inductive reasoning: each swan you see is white so “all swans are white” was a universal truth, until that is, a Victorian explorer found a black swam in Australia. The intuitive answer is 183 (ie half of 366, which covers every day of the year plus one). The actual answer is only 23 people. The reason is (without getting into detail) that you have to calculate the chances of an identical birthday for each person individually and sum all those probabilities up, rather than just dividing the chance for the group as a whole by half. And you get a 99 percent chance of two identical birthdays with just 57 people in a room. The birthday problem illustrates how we don’t appreciate the importance of all the interconnections between each and every variable that goes to make up events. Nor do we appreciate how fast all these chances add up until an unlikely event becomes not only probable, but actually likely. Investors know this as “tail end risk” and it’s very familiar to emerging market investors. You can price this risk and take bets on it. Nassim Taleb, the author of the bestseller, The Black Swan, has made a fortune selling options on tail end risks. His point was the straight-line inferences most traders make based on the news of A leads to B leads to "buy" is meaningless, “as the ability to compute a future path from mathematical models tends to zero very quickly given a ridiculously small number of variables,” said Plamen Monovski, the CIO of Renaissance Asset Managers. The Greek word for chance is “automaton,” which has turned into our word for robot. The reason for that is both Aristotle and traders share the belief that underlying the chaos of the real world is a mechanism that determines the outcome. You can predict what is going to happen next if only you look hard enough. This is known as “classical mechanics” and was codified by Sir Isaac Newton. The trouble is that the world doesn’t work like this. Quantum mechanics shows the universe is intrinsically unpredictable – enshrined in the Heisenberg uncertainty principle. You cannot, even in principle, know anything precisely. Particles travel along all possible paths at once and only “choose” a definite path when you measure them. Indeed, a measurement also chooses the particle’s past path. To scale this idea up to the everyday level, the analogy is: It is impossible to accurately explain current events, but it is easy to say what caused them in retrospect. Emerging market investors are good at dealing with black swan events as they are used to this unpredictability. Crazy things happened every day in emerging markets, as there is no system. A does not lead to B because someone in the middle is on the take and sends the trend off in some mad direction. The tail end of emerging market risk is fat. Western investors try to reduce risk by building institutions and promoting things like corporate governance. These things are useful, but emerging market investors are more focused on growth and opportunity: the risks are large but so are the rewards, and having grown up in chaotic markets, these investors are much more willing to “go with the flow.” This is why Chinese, Russian and Indian investors are all piling into Africa, whereas the big institutional investors are not, and why the emerging multinationals coming out of the BRIC countries will always have an advantage in each other’s markets over the established players.